The Swim Rotorua team collected a total of 48 medals at the Waikato Junior Swimming Championships. 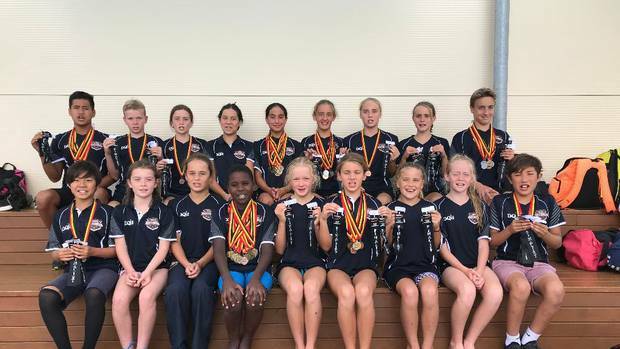 Swim Rotorua athletes have maintained their stellar start to the year with an impressive haul of medals at the Waikato Junior Swimming Championships. The meet, held at the St Peter's College pool in Cambridge, attracted more than 200 swimmers aged up to 12 from around the North Island. Many of the Rotorua swimmers produced outstanding performances including Matilda Kiss, 8, Emily Avis, 10, Hannah Kiernan, 11, Josie Marsh, 12, and Samuel Schulze, 12, who all posted personal best times in all of their events. The Rotorua team collected 45 individual medals as well as three medals in the hotly contested relays. Ariel Muchirahondo, 10, led the Rotorua medal charge with 10 individual golds, closely followed by Ngamihi Simpson, 12, who won nine golds. Division 2 champion Taonga Wharekura, 12, secured three golds and two bronzes. Siblings Mikulash, 12, and Karolina Joyce, 11, won 11 medals between them. Karolina edged it with a haul of two gold, two silver and two bronze medals, while Mikulash took home two silver and three bronze medals. The youngsters in the team all shone with Kai Jung Ishida, 9, winning silver in the 50m breaststroke, Hone Curtis,10, snagging four silvers, and Tamzin Joy, 9, taking three gold and two bronze medals. The boys' team of Taonga Wharekura, Samuel Schulze, Ariel Muchirahondo and Mikulash Joyce dominated the medley relay and secured gold by a handsome margin. They also won bronze in the freestyle event. The girls' freestyle team of Lizzie Avis, Emma Kiss, Ngamihi Simpson and Karolina Joyce had a nail-biting finish to take the bronze medal. Many other Swim Rotorua swimmers performed with distinction in their races including Ashleigh Randall, Anna Blanco, Hannah Buchanan and Lily London. Head coach Alastair Johnson was "really impressed" with another quality showing by his young team. "The whole team has performed exceptionally well. They all raced really well by winning 48 medals, but more importantly, they showed their team qualities by supporting and encouraging each other right to the last race. It is great to see that, and know that these youngsters will soon be racing on the national stage."